A Swansea heroin addict has been jailed for 13-and-a-half-years over the death of his girlfriend. Dean Jones, 38, pleaded guilty to manslaughter on the first day of his trial at Swansea Crown Court for killing Alison Farr-Davies, 42. Sentencing, Judge Keith Thomas said her death involved "a wholly unprovoked and senseless attack" in September 2016. The court had heard the pair's relationship "involved class A drug use". Jones admitted not seeking medical help soon enough for Miss Farr-Davies after she fell down the stairs of their flat and suffered a serious head injury. A pathologist also described other injuries such as broken ribs, bite marks and blunt trauma to her face consistent with an assault. Defence barrister Sarah Elliott said the pair moved into a house in the Hafod area of Swansea together with the intention of making it their home. 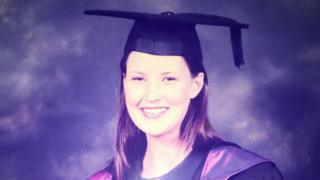 There was "no evidence of a relationship categorised by violence" before the fatal incident, she added. The court heard, however, the couple had been quarrelling because they were both going through a period of withdrawal as they tried to get off class A drugs. Toxicology tests showed Miss Farr-Davies and Jones were in a state of withdrawal at the time of the incident. The judge said Miss Farr-Davies was "incapacitated by her withdrawal from drugs which means she was entirely defenceless". Her family has received more than 300 cards of support, with a statement describing Miss Farr-Davies as a "kind and gentle" person who "would never hurt a fly". "He is a monster for what he did to Ali. He has robbed us all of such a beautiful person," her sister Louise Staples said. She added: "Ali's death is with us every day, I only have to hear a song on the radio and I end up in tears. "My parents have lived in this area all their lives and it is difficult for them to go out and see so many people they know without getting upset." Det Insp Dean Llewellyn said the attack brought "shock and sadness to the community", adding it highlighted the "devastating consequences" of domestic abuse.